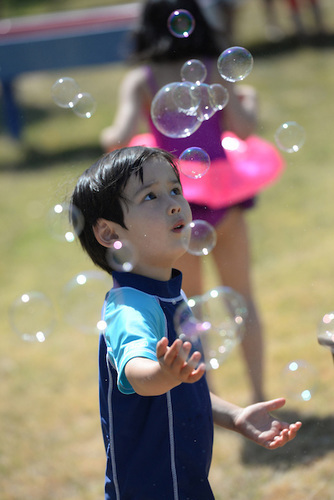 With just a little bit of water and a whole lot of fun, the students at Harker Preschool celebrated the end of the school year with “Splash Day.” Held on the campus’ large field on the morning of June 4, the event saw parents joining in on the action alongside their children. The preschoolers came to school dressed in their swimsuits and cover-ups in eager anticipation of the day, which also included an interactive bubble show in the gym. In keeping with Harker’s effort to conserve water, all splashing activities took place on the field where the water would benefit the grass. The day’s activities featured small pools filled with water and toys for pouring, splashing and squirting; ball pools (with just a little water and a lot of balls); bubble stations (for making big bubbles using a wand and a hula hoop); ice discovery tables; under-the-sea tables; wet sponge block building; wet foam picture crafts; and beach balls and toys strewn around the play yard. A number of parents helped with setup and cleanup, for which the preschool’s staff was very appreciative. “We think we did a great job providing exciting water activities for the children, while keeping our ‘water conservation hats’ on. The children were all thrilled to be in their bathing suits at school and to run around on the big field. The day was definitely a splashing success!” recalled Kelly Espinosa, director of summer and preschool programs.